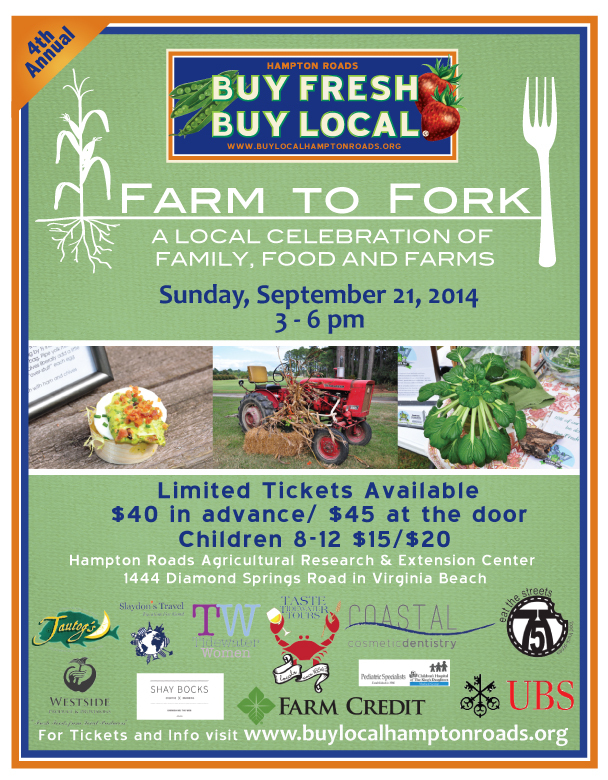 The local chapter of Buy Fresh Buy Local is holding its annual Farm to Fork extravaganza September 21, 2014. I went last year and had a great time checking out what the area had to offer in the way of fresh foods straight from the fields, waters and land. There was a ton of food and live entertainment. They did a good job of letting people know what was being produced right here in Hampton Roads. In addition to food there will be regional Chatham Vineyards wine and local craft beers from Beach Brewing Co., Back Bay Brewing and Smarthmouth. A silent auction will be held too. Check out the photos from last year and please click the link to purchase tickets today! The event is a lot of fun and you'll be helping out our local farmers, makers and culture. Farm to Fork Evenbrite page for tickets HERE!